Once upon a time, I was pretty much a red-only wine drinker. In the past couple of years, however, I’ve ventured into whites and Rosés, as well. As I continued my journey in the realm of whites, I came across this delightful, refreshing Chenin Blanc. I’m a recent convert to Chenin Blanc. I have childhood memories of neighborhood parties, where the adults were drinking cheap, jug Chenin Blanc. I recall it being a very sweet, low-end wine. As a result, when I started enjoying wine, I avoided Chenin Blanc. Fortunately, that changed when I received a sample of a Chenin Blanc. Tasted with a fresh, open mind, I thoroughly enjoyed it. Thus began the quest for more delicious Chenin Blancs. Today my quest brought me to this delightful example. From the Western Cape region of South Africa, the Spier 2015 is light, crisp, and refreshing. The color is light Amber in the glass. Initial aromas are apricot and tropical fruit. The wine presents with a luscious mouthfeel balanced by fresh acidity. The stone and tropical fruit flavors continue on the tongue with mango, passion fruit, and peach, as well as fresh pear. Typical of the recent Chenin Blancs I have had, this is dry, but fruit-driven giving it a pleasantly sweet feel. The wine finishes well, and is very refreshing. As summer like weather continues to persist in Northern California, cool, refreshing whites are a delightful way to relax. 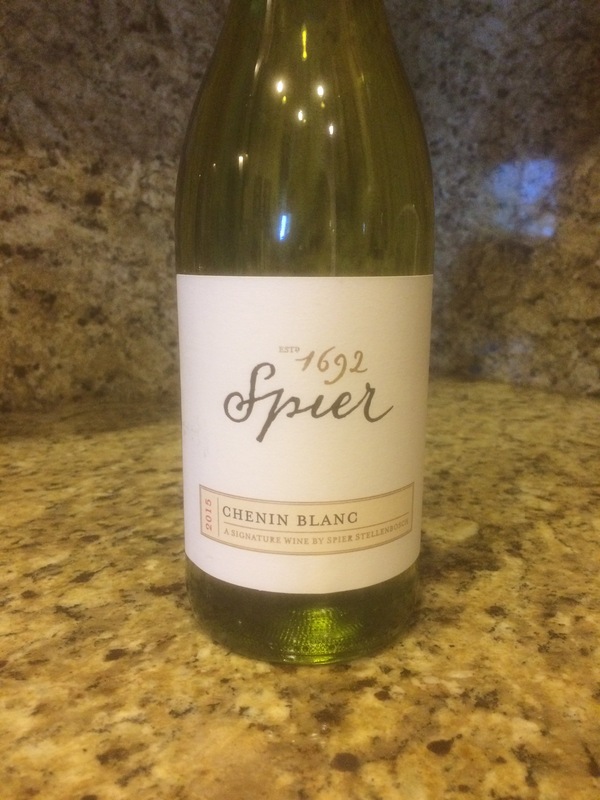 Spier Chenin Blanc 2015 is a good pick. I found it at Total Wine & More for only $7.99, making it affordable as well as enjoyable.